TOKYO — The first Major League Baseball game of Yusei Kikuchi’s career came in the final game of his boyhood idol’s Hall of Fame career. And they did it together as teammates for the Seattle Mariners while playing in their home country. As a young boy and later a rising star in Nippon Professional Baseball, Kikuchi often dreamed about the day he would pitch at baseball’s highest level. The scenarios varied, but they always led to that defining moment in his career. “It’s hard to put into words, but it’s going to be a day I’m never going to forget,” he said through interpreter Justin Novak. Even he admitted he never imagined his MLB debut would unfold this way. How do you describe your wildest dreams somehow being exceeded by real life? After signing a four-year contract with the Mariners in the offseason as Japan’s top pitcher, Kikuchi spoke with an earnest reverence toward Ichiro — a player he worshipped as a child — and seemed nervous about the possibility of simply meeting him. On Thursday, as Kikuchi made his way to the mound in the bottom of the first inning to throw his first pitch as a big-leaguer, Ichiro was running to his customary spot in right field as his teammate. 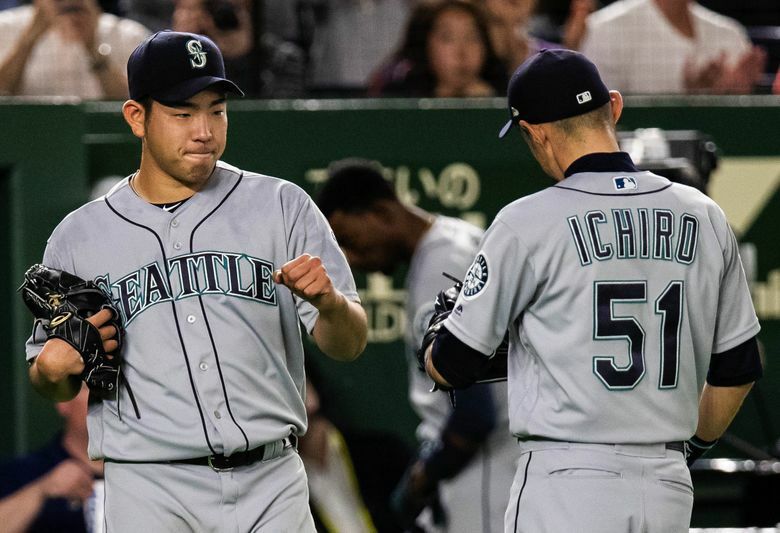 After the Mariners’ extra-innings win Thursday in Tokyo, new M’s pitcher Yusei Kikuchi explains what his childhood hero Ichiro means to him. Ichiro retired after the game, ending 28 years in professional baseball. As if the pressure of making his first big-league appearance in his home country with more than 46,000 fans packed into to the Tokyo Dome wasn’t enough, Kikuchi also knew this would be his hero’s final game. He wanted so much to pitch well so Ichiro would leave with a victory. In terms of an MLB debut and the extenuating circumstances, Kikuchi’s outing — 4 2/3 innings of work, allowing two runs (one earned) with a walk and three strikeouts — was a solid showing. Unlike many big-league pitchers, Kikuchi didn’t head back into the clubhouse after his outing. He stayed in the dugout, wanting to soak up every second of the historic occasion. He could only think back about seeing a young Ichiro playing outfield for the Orix BlueWave. Ichiro’s successful transition from Japan to MLB and his massive success provided the inspiration for a generation of players in Japan and the U.S.
Kikuchi studied not only Ichiro’s success but also his reasons for it. Just before the bottom of the eighth inning Thursday, manager Scott Servais lifted Ichiro from the game in a manner befitting the moment. Ichiro made his way to right field alone while the rest of the team remained in the dugout. The public address announcer informed the crowd that Ichiro was being removed. With rumors building that Ichiro would announce his retirement following the game, fans were aware of the situation and gave him a standing ovation as he jogged back off the field. His Mariners teammates, understanding the moment, were waiting in front of the dugout to greet him with hugs and congratulations. One by one, they hugged the legend. When it was Kikuchi’s turn, his arms shook and his eyes welled up with tears. He didn’t want to see Ichiro leave, his experience as Ichiro’s teammate ending after such a short time. Minutes later in the dugout, Kikuchi still was trying stop the tears.